Agmon Lake, a site that was rehabilitated by re-flooding, is an important wintering site for many migrating bird species. 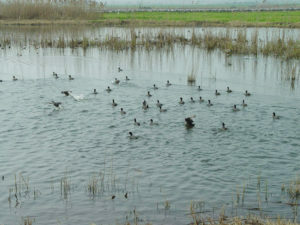 In recent years there was an increase in tourism, with the wintering birds as one of the main attractions. Increased tourism is expected to disturb animals in terms of their feeding, resting and sleeping habits. 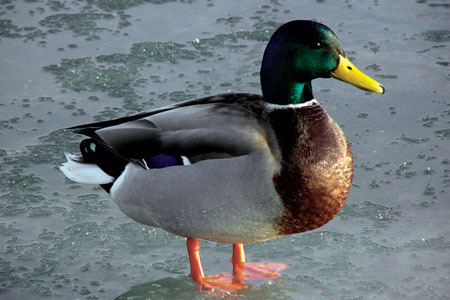 This, together with other factors such as predators, can have a detrimental effect on wintering waterfowl. The influence of tourism on waterfowl was studied by observing waterfowl activity in the lake, using a controlled experiment of Flight Initiation Distance (FID). The results of the experiment showed that the distance to approaching humans had the highest influence on FID; group size and site also influenced FID (Adj. R2 = 0.95). The analyses showed that as the number of tourists at a site increases, the percentage of sleeping birds decreases and their distance from the lakeshore increases. Control the number of tourists at each site along the lakeshore to prevent high peaks in tourist numbers. Build structures to hide tourists from birds. Put up signs to guide tourists where to walk and what is the proper behavior. This will decrease waterfowl anxiety, and increase the potential to observe birds. Study abstract – (Hebrew). Download.